Mr Porter has joined forces with Prada on a menswear collection that will be the first of the Italian luxury fashion house to launch exclusively with an online retail partner. Prada said the project is part of its digital transformation, and that Mr Porter is “the perfect partner” to take this step. The collection, made up of 32 pieces across ready-to-wear and shoes, draws inspiration from the eras of bowling popularity, the 1950s and 1980s. It includes camp-collar shirts in Hawaiian and pop-cartoon prints, and madras and gingham checks; mid-century-style block-panelled stripe cardigans and stripe knit t-shirts and blouson jackets in satin and suede. Continuing fashion’s love affair with logos, there are also two printed t-shirts with exclusive Prada bowling logos. Pleated and flat-front trousers, polo shirts and a mohair bi-colour wool blazer complete the ready-to-wear offering. The vintage inspiration also informs the range’s footwear styles, with loafers, creeper and cap-toe Derbies and cap-toe sneakers completing the look. “We are extremely pleased to be part of this exclusive project in collaboration with Mr Porter that we consider being the perfect partner to communicate the values of the brand,” commented Stefano Cantino, group strategic marketing director at Prada. To celebrate the partnership, Mr Porter will launch a global marketing and content campaign across its social media, email, website and app platforms. 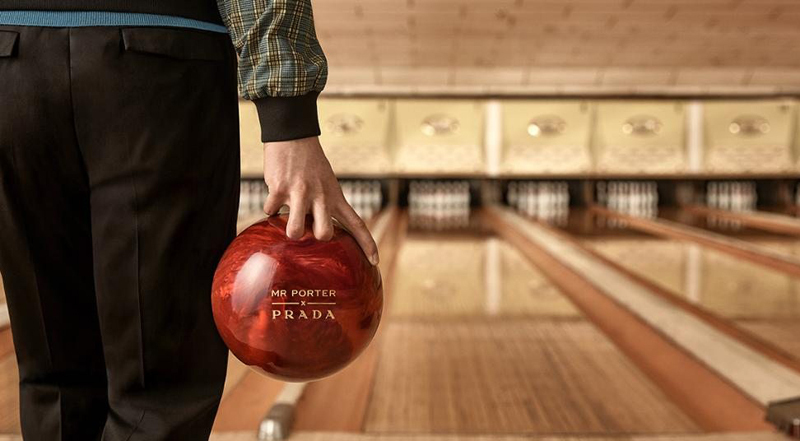 It will also host a Mr Porter x Prada bowling event in New York City in 26 of April, following the official debut of the collection a day earlier.